The Rhesus Chart book review . “Vampires have lost their bite!” It’s a common refrain in genre circles, often from horror fans grumpy that teenage girls have stolen their toys and aren’t playing with them properly , but it is true that writers out to tackle bloodsuckers need a distinctive approach to make them stand out from the crowd. 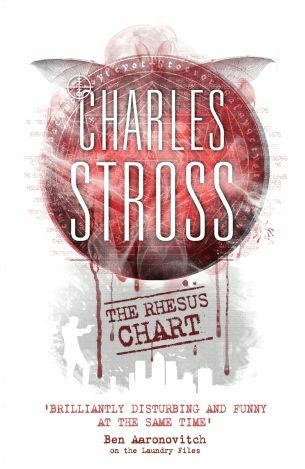 Charles Stross has never been short of attention-grabbing approaches, and the latest instalment in his Laundry Files series gives vampirism an entertaining and satirical twist. Stross has pulled off yet another fast-paced blend of espionage thrills, mundane office comedy and Lovecraftian horror, throwing in so many ideas per page that it may well leave your head spinning. There are a couple of early points where the tone pitches a little too far towards comedy, but otherwise this is yet another ferociously enjoyable romp from a writer who’s showing no signs of slowing down or losing his touch.